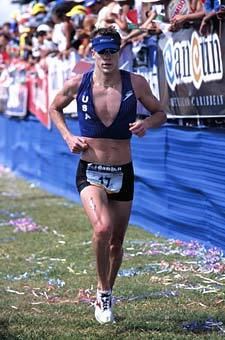 Hopes were high for the American elite in 2002 in Cancun. 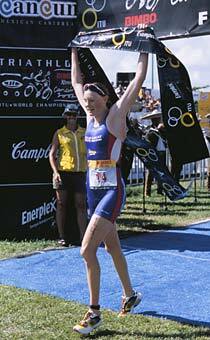 The US women were ranked one and two by the ITU, and, the likelihood that this would be Siri Lindley's last pro championship run, coupled with Barb Lindquist's quest to prove she could win in the heat, ran expectations high. 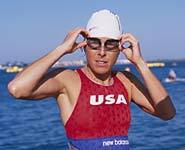 Siri Lindquist prepares for her last ITU Worlds swim. 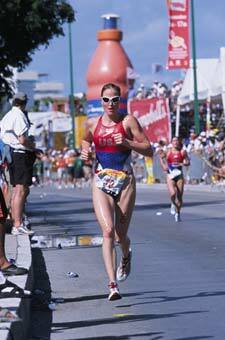 Although Lindley would end her pro World's run nearly 3-minutes out in thirteenth place, Barb Lindquist kept hopes high right to the end with what appeared to be a sure win--until the last 300 meters of the run when Britain's Leanda Cave surged ahead for the victory. With Lindquist second, the American women fought their way to four top 20 finishes with Laura Reback placing third and Susan Williams finishing in the 20 spot. 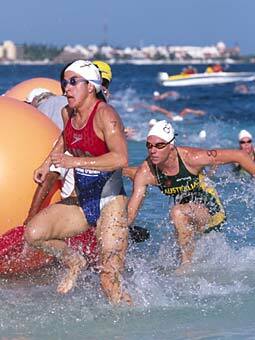 Barb Lindquist leads Sheila Taormina and the rest of the elite women around the swim turn in Cancun. 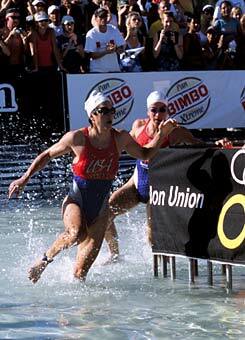 Sheila Taormina exits the water ahead of Australia's Nicole Hackett. Barb Lindquist continued her punishing pace and looking strong into the bike. 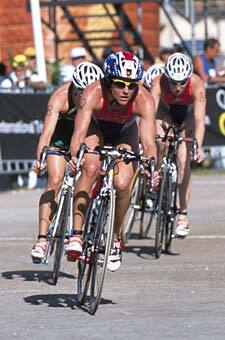 Number one ranked Siri Lindley, appearing in her last ITU pro race, exits T2. America's hope in the men's race, Hunter Kemper, would finish the day just under two minutes behind Spain's Ivan Rana. 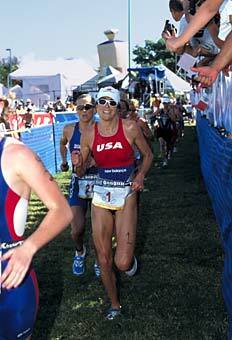 Laura Reback pushed on for a seventh place finish as the second American Woman. 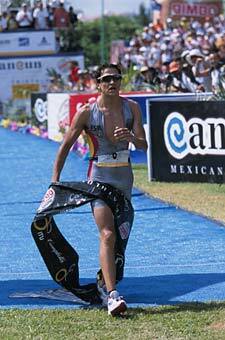 Spain's Ivan Rana crossed the finish to the cheers of Cancun's Spanish speaking crowd. Leanda Cave spoiled Barb Lindquist's day in the sun in the last 300 meters of the run but brought joy to the Brits with her first place finish. 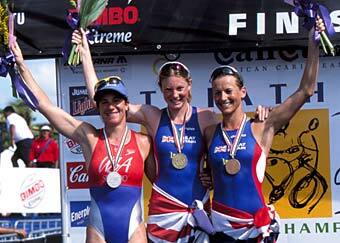 On the podium, Leanda Cave is flanked by Barb Lindquist and Michelle Dillon.